I missed Day 5 of the Bikini Body Mommy Challenge last night. Thursdays are especially hard for me, because I leave for work at 6:30 and don’t get home until 10pm. Last night I also had a unit final in Italian, and by the time I finished that it was midnight. Rather than trying to push through a workout that late, I made the decision to go to bed and wake up early today to do the workout. I don’t want to get a day behind, so I will also do the workout for Day 6 today — normally this wouldn’t be a great idea, but Day 6 is a cardio day, so it just makes today a little more intense. I’m going to try to shuffle the workout days around so that Thursday is my rest day (right now tomorrow should be my rest day). The weekends are when working out is the easiest, so having Saturday as a rest day is just a huge waste. The workout was intense today! I’m actually a little surprised at how hard these workouts are for me, but I love how I’m feeling right now. I’m super sore and tired, and I’m sprawled out with my post workout protein smoothie and that warm, dead feeling is spreading through my muscles…it’s glorious! Is that super weird that I love when my muscles feel like limp spaghetti? The trainer keeps the workouts really simple — there are only 8 moves in today’s workout — but the moves are mostly compound exercises that kept all of my muscles fatigued. By the last set of tricep dips, I nearly fell off the chair my arms were so smoked! Here is today’s workout — since it’s free I don’t think she would care if I shared it with you. If you want the video to follow along with, you can google the Bikini Body Mommy workout — the videos are on her blog as well as on YouTube. Like I said — very simple, but surprisingly intense. We did this superset 3 times, which took about 25 or 30 minutes. 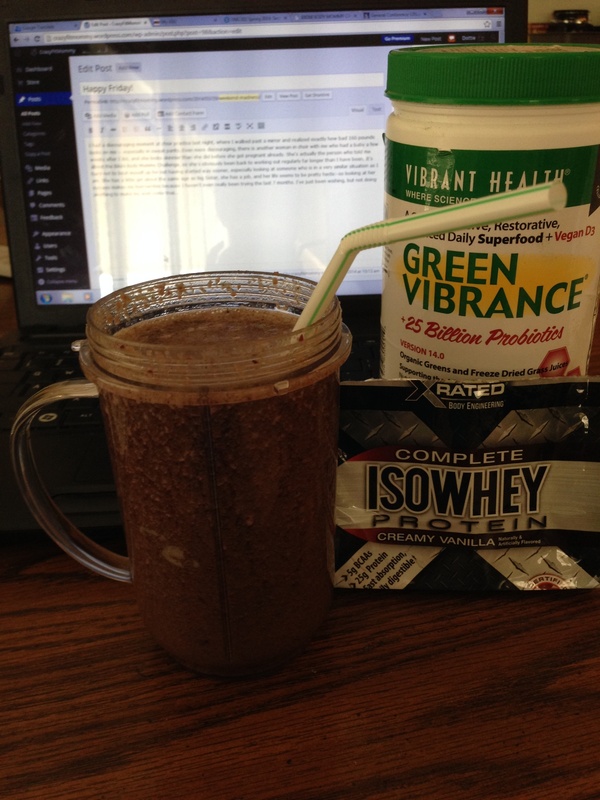 Post workout, it was time for some stretching, some blogging, and some breakfast! I know that looks pretty gross but it’s actually really yummy. I just threw mixed frozen berries, half a scoop of Green Vibrance, and half that packet of vanilla protein powder into my Magic Bullet, along with some spinach, half a carrot, and enough water to just barely cover most of that. Hi-health had a sale last week and this green drink was half price so I gave it a try. On its own it tastes terrible, but mixed in a smoothie like this you can barely taste it. The protein powder was a free sample, and it really wasn’t bad at all — I’m usually not a fan of the flavor of protein powder. I’ve had my Magic Bullet for years, and it’s one of my favorite appliances. When I have no time for breakfast, I can make a shake in 2 minutes or less and not have to find a cup to transfer it into! Well, Baby Boy is waking up, so it’s time to make a bottle. Then on the agenda for the afternoon — HIIT cardio workout (I’m going to do 1 minutes intervals up and down stairs for 20 minutes), a shower! !, and Disney on Ice. Big Sister doesn’t know yet, and we’re super excited to surprise her! How do you stay active with kids during the summer? It’s already over 90 degrees here, and it’s been hard to find active activities that wouldn’t involve sunburn or heat exhaustion…but staying in the air conditioning usually means way more TV time than kids should have.